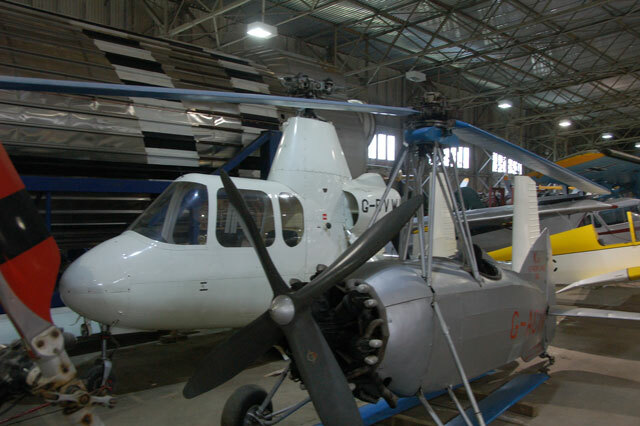 Aircraft in foreground is the Kay 33/1 gyroplane. Photograph provided by Mr.Quintin Smith. Photograph provided by Mr. Quintin Smith. The Kay Autogyro is a single seat design and is a very historic aircraft in regards to rotor control. 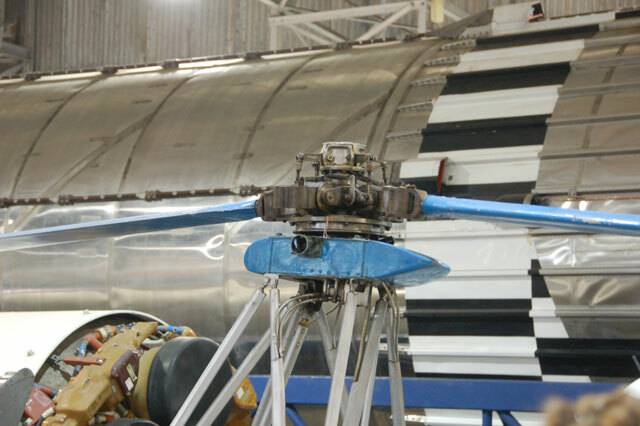 As the WRK Gyro was the first rotorcraft to successfully fly with pitch controls, the Kay Autogyro was the first rotorcraft to employ collective pitch control and usher in the development of a truly practical helicopter. The first Kay Autogyro was designed by a Scotsman by the name of David Kay (see resources) and John Grieve of Scone. The aircraft was built by Shields Garage in Perth, but rest assured do not take this homebuilt-experimental aircraft lightly. The first aircraft was successfully test flown and from this design came the Kay Type 33/1. 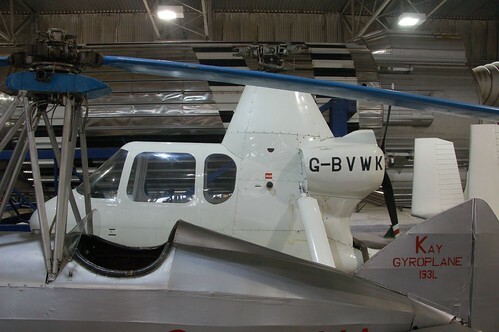 Bradbury, Cull and Oddie built the 33/1 gyroplane. It made its first flight in early 1935 from Eastleigh Aerodrome in Southampton. It was this aircraft that utilized a collective pitch control to evenly change the pitch (collectively) of the rotor blades. This procedure changes the angle of incidence of both blades at the same time. The single place aircraft had nice lines very similar to the modern Pitbull gyroplane design. The ship was powered by a 75 hp Pobjoy engine of seven cylinders with a four bladed wooden propeller. The design was shown around the country at airshows and received a very favorable rating when tested by the British Air Ministry. C/N 1002, registration G-ACVA was the only aircraft of the type built and is beautifully restored and on display at the Museum of Flight in Scotland. While most have forgotten of this very historical aircraft when speaking of rotorcraft history the impact of the little ship cannot be ignored. Unfortunately little has been written of it but it was the successful flights of both the 33/1 and WRK Gyro that laid the foundation of rotor control from which the modern helicopter and modern gyroplane were developed. From this point onward the ability to directly control the flight of aircraft by means of the rotor was possible. Not only has the aircraft not received its due recognition neither has the aircraft designer as very little can be found in regards to written documentation on David Kay or his one of a kind design. We should be thankful that the original aircraft is historically preserved for all to see. Kay was called up for service with the British Royal Air Force and sent to Canada as a flight instructor. During this time Kay’s patents ran out from which others were able to capitalize on his ideas. Following the war Kay returned to Scone and continued as a flight instructor. Museum of Flight, East Fortune, Scotland. The Illustrated Encyclopedia of Helicopters by Giorgio Apostolo, copyright 1984, published by Bonanza Books and distributed by Crown Publishers Inc. (Note this resource references Kay as being an Englishman, which has led to some confusion among some historians, but he was in fact a Scot). ISBN: 0-517-439352. My many great thanks to Mr. Quintin Smith for the use of his beautiful photographs.